The five bandmates that make up NCT Dream went live Monday, keeping fans up to speed while trying not to expose too many details from their recent visit to Indonesia. They went on to thank fans for their music video logging 10 million views. 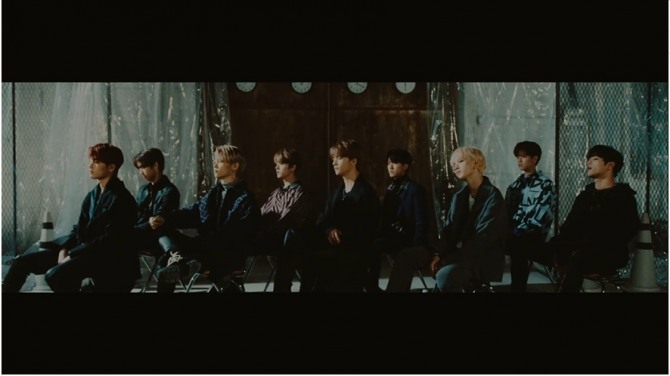 NCT 127, another subunit of NCT, was featured on “Let’s Shut Up and Dance,” the first track and video of a four-part global tribute to Michael Jackson. 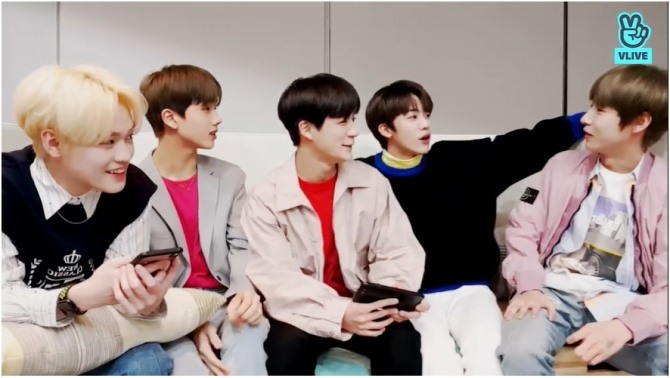 The bandmates also teased Jeno after Chenle revealed that Jeno spends so much time playing games that he was planning to give him a headset for his upcoming birthday. Watch the full clip at https://www.vlive.tv/video/123823. The boy band sits in rows in front of a wall where four clocks emit threateningly loud tick-tock sounds, spitting skepticism against the notion that time heals all wounds. Co-written by Bang Chan, Changbin and Han and also co-composed by Changbin, the song combines Greek god of time Chronos and Kronosaurus, one of the largest and most vicious marine reptiles from the Mesozoic Era that was found in Australia. It is themed around those trapped in an urban jungle chasing their dreams but also being chased by time. “I used the metaphor of a fearsome creature or a monstrous figure to sing about time,” said Chan. Watch the full video at https://www.vlive.tv/video/123819. 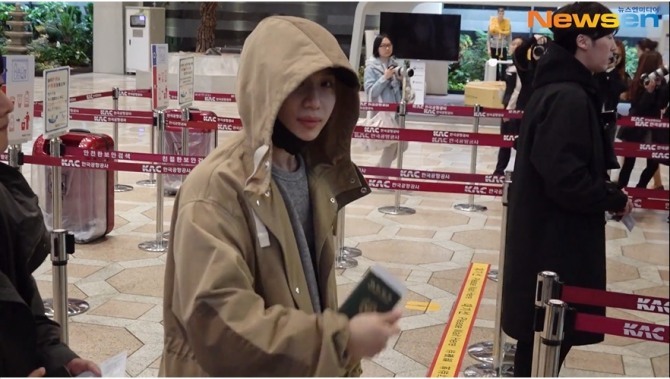 SHINee’s Taemin was seen at Gimpo International Airport before heading to Japan for a radio program. The youngest of the five-piece boy band has become the only active member after seeing off Minho, who began his military duty Monday. The two posed together for a picture uploaded to the band’s official Instagram that wished Minho would stay healthy and safe. Minho applied to join the Marine Corps in January and was granted admission last month, according to the group’s parent company. Onew and Key are now serving in the Army. Taemin will continue, embarking on his first arena tour in Japan in June, visiting six cities for a 14-performance tour starting from Hokkaido. This is his second solo tour. He released the first full-length self-titled album in Japan in November, topping Oricon’s daily albums chart. His photography book sold over 10,000 earlier this month, also topping Oricon’s weekly chart. Watch the video at https://www.vlive.tv/video/123816. EXO’s Xiumin had a great time playing sports with his childhood friends and two bandmates at a huge indoor sports amusement park. After Xiumin’s introductions for Chen, Kai and his friends, the group of five began exploring, led by Chen who had already acquainted himself with the venue. They agreed to start with a soccer simulator as a warmup. 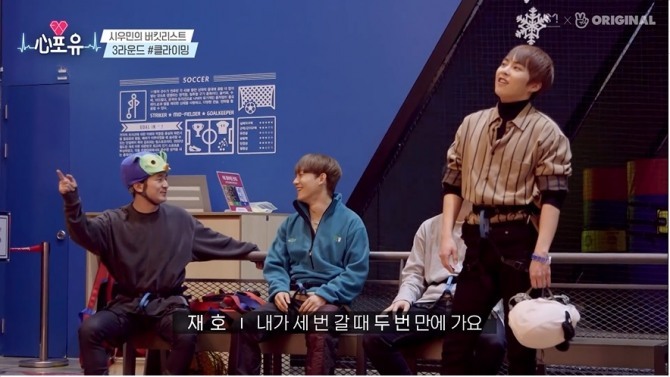 Xiumin and his friends talked about having bonded over the sport during their youth, but Xiumin failed to score a goal. Moving on to a baseball simulator, they all quickly forgot about their initial shyness and focused on not losing each game, high-fiving at Xiumin’s mistakes. Watch the clip at https://www.vlive.tv/video/123594.